PANTHEON X is a new way for people to invest in cryptocurrency funds. It offers a marketplace with transparency for security, making it easy to invest. The marketplace is powered by artificial intelligence and the Knowledge Network. 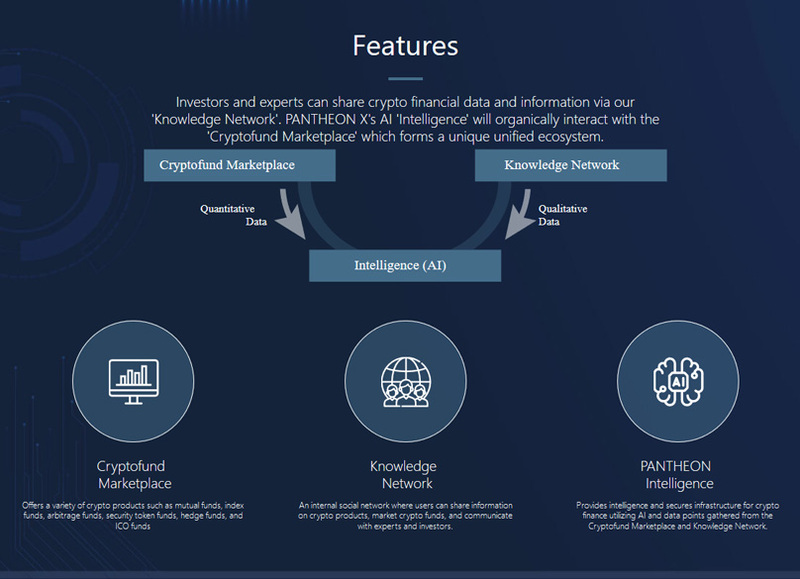 PANTHEON X is a financial platform in its fourth generation. It uses the blockchain system to deliver reliability and transparency. The result is an encyclopedia cryptocurrency financial service. These services are able to generate, circulate, trade, and mediate security and utility tokens. These security tokens can be based on bonds, stocks, and assets (BT, ET, and ABT, respectively). One of the goals of PANTHEON X is to provide the ability for anyone to participate in providing or receiving professional services. This is achieved thanks to the open platform that works on the private blockchain. Anyone can use PANTHEON X to show their expertise in a field by sharing data within the blockchain. The information generated is fairly evaluated and rationally compensated. This allows for accurate, fair information without the typical bias toward a group typically found in this type of information. Another key goal of PANTHEON X is to provide transparency, including for efficiency and authenticity. The platform allows for timely access to accurate financial information, which can also be shared. The fund management is secure and transparent, allowing for easy asset management that is efficient. Thanks to P2P trading based on smart contracts, PANTHEON X is able to minimize risk as well as transaction time. This is possible by reducing the trading procedures and intermediaries. There are also upgraded services for improved efficiency, such as marketing with AI and detection of abnormal transactions. What Problems Does PANTHEON X Aim to Solve? PANTHEON X aims to resolve a number of issues that investors, professionals, and the service infrastructure all deal with. Currently, investors have trouble finding a counterparty that they can trust. They also deal with a lack of transparency and a breakdown in communications. Professionals like crypto managers suffer from the lack of any service infrastructure. They also deal with the lack of transparency and the distrust. Additionally, there is a lack of opportunities for professional work, even for those with experience in investment and analysis. The service system and infrastructure have their own problems, including inefficiency and the risk of human mistakes. They also deal with data being fragmentized, and management that is economically wasteful. How Does PANTHEON X Resolve Those Problems? The infrastructure provided by PANTHEON X lets investors and financial experts trust each other and complete trades. The PANTHEON Protocol, the mainnet, was built using Hyperledger Fabric. This open-source solution has been tried and tested by numerous organizations with big names such as Dapp and IBM using it. This shows the reliability of the Hyperledger Fabric, inspiring more confidence in PANTHEON Protocol. The ability to invest in cryptofunds offers many advantages that PANTHEON X can pass onto its users. 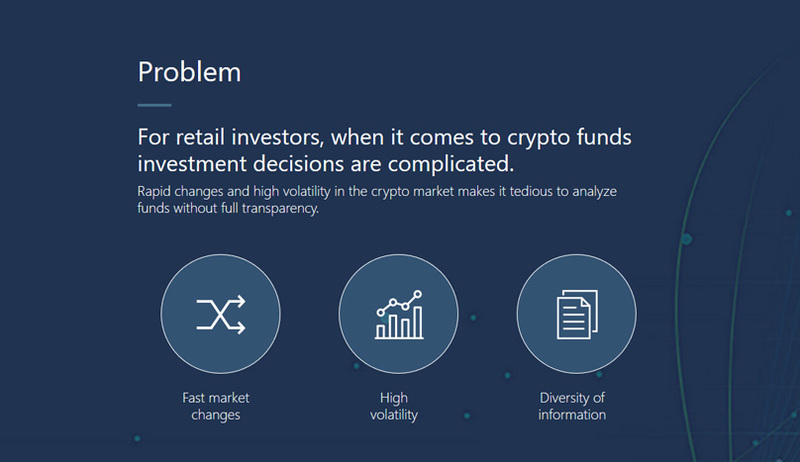 With other types of crypto investments, investors must make complicated decisions. This is further complicated by the high volatility and quick market changes in the crypto world. To make it even worse, there is a lack of transparency and finding information requires checking multiple sources. Investing in cryptofunds is safer and easier. 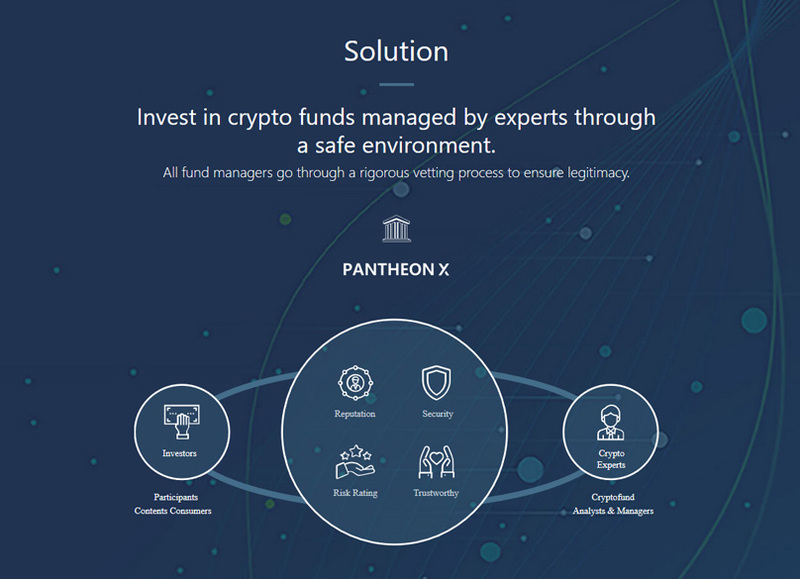 The funds offered on PANTHEON X are managed by experts and use a safe environment. All of the fund managers on PANTHEON X must undergo rigorous vetting. This allows PANTHEON X to ensure all fund managers are legitimate, keeping the investors safe. Experts like cryptofund analysts and managers come together with investors, participants, and consumers of content in the cryptofund platform. The platform then involves all three of the following. The cryptofund marketplace in PANTHEON X is where users can set up, then sell financial products based on cryptocurrencies. Fund managers can safely and easily set up their crypto funds and provide operational reports. Investors can use the marketplace to buy and search for the best products. The Knowledge Network is a community network dedicated to communication and marketing. Crypto experts market their funds as well as paid content. They also communicate with investors via this network. The investor participates in the Knowledge Network by creating and reading content, sharing, and voting. Finally, Intelligence is the STO platform for issuing and selling security tokens. This last element is the brain for PANTHEON X. It receives quantitative data from both the cryptofund marketplace and the Knowledge Network. The Intelligence AI scores experts and their track records and matches investors with funds. It also analyzes transaction data and detects fraud and crimes. Intelligence provides service to third-party services while those third parties provide data in return. How Will Users Utilize PANTHEON X? Investors can use PANTHEON X to find the ideal fund, thanks to performance rankings. They can also find funds to meet their chosen risk levels. The tools on the platform help gauge trade history and execution. Investors are even able to communicate directly with fund managers, allowing for constant updates. Fund managers will find it easy to integrate with PANTHEON X thanks to the exchange APIs. They can use the dashboard to create products, financial reports, and funds. The distributed ledger tech lets fund managers prove their knowledge and expertise. They can also use the platform to gain more investors and focus on their trade performance. PANTHEON X follows a dual token system. XPN is the PANTHEON X token. The supply is created by holders of XPW exchanging their tokens to XPN. XPN is used by crypto managers to build their fund portfolios. It is also used to set up funds, pay performance fees, and buy paid content from the Knowledge Network. XPW is the XPower token. Those who are active on the Knowledge Network receive XPW as compensation for actions like reporting, sharing, and creating content. This token can be used to increase reputation and influence within the community on Knowledge Network. It can also be used to collect dividend revenue on the PANTHEON X platform. 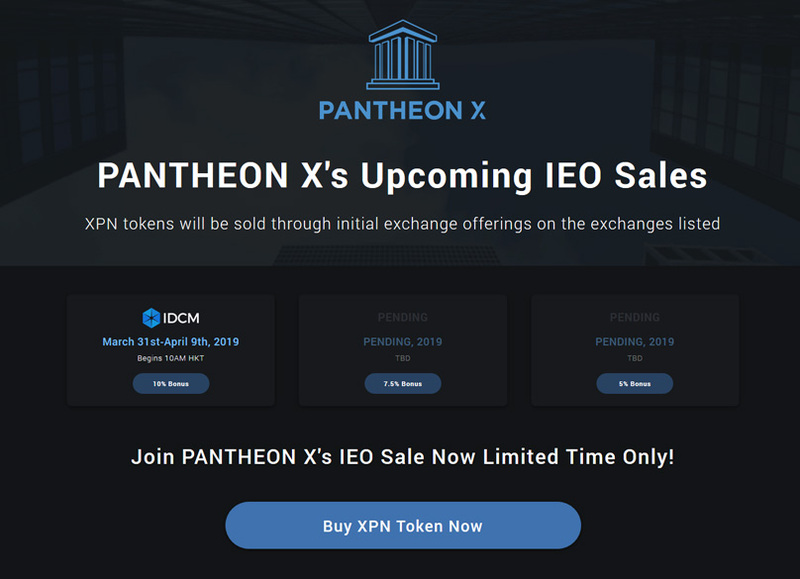 XPN tokens are being offered via an IEO ( Initial Exchange Offering) and are available to purchase now, visit the IEO page for more information. There is a total of 800 million XPN, with each XPN equal to 0.00025 ETH. This is an ERC-20 token. The soft cap is set to 10,000 ETH with a hard cap of 60,000 ETH. During the sale, BTC, ETH, and USDT are accepted. The sale runs from March 31 to April 9. Of the total 800 million XPN, 30 percent goes to contributors. 20 percent goes to business development. 16 percent is for the founders and team with 15 percent for reserve and operation. 15 percent goes to marketing and 4 percent is for advisors. The PANTHEON X roadmap begins in December 2018 when the development of the mainnet began. In January 2019, the private sales began. This is also when the Dapp development began. March 2019 includes main sales and completing the mainnet development. This is also when the Dapp demo is announced. Q2 of 2019 will see the launch of the beta service. This is also when PANTHEON X will launch three crypto funds. These will include Index, Arbitrage, and Active Funds. Q3 will see the official service launch and security token transactions. It will also see new funds launched, including asset-backed tokens and ICOs. Q4 will see the launch of the STO platform and the STE exchange. PANTHEON X aims to offer a simple solution for those looking to manage or invest in cryptofunds. The platform has a convenient marketplace as well as a Knowledge Network for communications and content sharing. The use of AI further enhances the platform.